In this signature work, Beckmann exudes self-confidence, control, singularity and even arrogance. Woe to Max Beckmann. So much criticism appraising his work faults him—for his dark views, his lack of humor, his penchant for larding his works with allusions, his ponderous writings about art—before going on to praise him as one of the greatest artists of the 20th century. But then there is his marvelous "Self-Portrait in Tuxedo," the signature work of the Busch-Reisinger Museum of the Harvard Art Museums in Cambridge, Mass. Universally admired, it brings out adjectives like bold, strong, elegant. In it, Mr. Beckmann is a captivating creature. 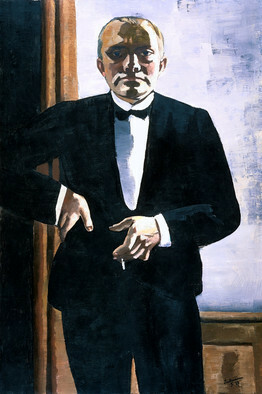 And when Mr. Beckmann made this self-portrait, in 1927, he was indeed at the height of his powers. Born in 1884 in Leipzig, the son of a flour merchant, he was drawn to art as an adolescent and always aspired to greatness, particularly admiring Rembrandt, Cézanne, Van Gogh and the northern Renaissance masters who preceded them. Early on, he painted in an academic, classical style. But after serving as a medic in World War I, and suffering a nervous breakdown, Mr. Beckmann returned to art with a more expressive manner, producing the works that make him an important painter. He did not, however, consider himself to be a disciple of Expressionism, the cultural movement emphasizing emotion over observation that in 1920s Germany was gaining mass appeal. He declaimed against abstraction. For a while, he associated with the New Objectivity movement, founded by Otto Dix and George Grosz, that joined unsentimental realism with a large dose of satire to comment on postwar German society. But Mr. Beckmann, his many fans would posit, preferred to shun all labels. An intellectual painter, well-versed in philosophy, he believed in figurative painting, though he strived to advance it and, like the Expressionists, he sometimes deployed daring colors and distorted shapes to do so. Over his career, which ended when he suffered a fatal heart attack on a New York street in 1950, Mr. Beckmann depicted many subjects. His most common themes were man's inner self and the mysteries of life, but he did landscapes, cityscapes, history paintings and mythological works. He painted circuses and cabarets, disasters and death. He made large allegorical triptychs. And starting in his midteens, Mr. Beckmann frequently painted that most revealing of genres, the self-portrait. Over the years, he painted himself with a horn, with a champagne glass, in a hotel, with a red scarf, with a saxophone, in a bowler hat, with soap bubbles, as a medical orderly, in Florence, in front of a red curtain, in a sailor hat, as an acrobat on a trapeze, in a blue jacket, on and on—and, in 1927, in a tuxedo. By then, nearly a decade after the end of the war, Mr. Beckmann was renowned in Germany, honored by the government and awarded a prestigious teaching post in Frankfurt. German culture was thriving, and Mr. Beckmann had recently written an essay called "The Artist in the State," which laid out his thoughts about the position of artists in the Weimar Republic. As Mr. Beckmann saw it, artists were members of the social elite. They should be among the leaders in the new social and political order, and they should dress the part. To Mr. Beckmann, that meant that artists should wear the uniform of elegant, manly tuxedos (or at least dark suits). In his simple but imposing painting, Mr. Beckmann stripped out distracting details, like buttons or cufflinks or a setting. His image fills the frame tightly, and the only prop—other than the slim cigarette dangling from his left hand—is the background window that frames him and provides the dramatic backlighting that models his mask-like face. Mr. Beckmann dispensed with color, too. Black and white dominate, applied in layers with brushy strokes, with black reaching its deepest tone in the velvety tuxedo. The lighting focuses the viewer's attention on Mr. Beckmann's head and hands, linked by the pure white of his shirt. With his right hand on his hip, Mr. Beckmann confronts the viewer straight on, his eyes wide-open and alert. Neither smiling nor frowning, Mr. Beckmann exudes self-confidence, control, power, singularity (brilliance?) and even arrogance. As always in his works, Mr. Beckmann is grappling with his inner world. Yet, as he once wrote, "The self is the greatest veiled mystery of the world," and Mr. Beckmann may be presenting a conflicted image. Some art historians see a disquieting element to the painting. Is his stance a swagger or is it sinister? Why is his face so shadowed? Is he becoming discomfited with the direction of German politics, disillusioned by society? Is he commenting on man's inevitable feelings of estrangement? The beauty and brilliance of "Self-Portrait in Tuxedo" was obvious, though, and it was purchased by the National Gallery of Berlin in 1928. In 1933, the museum created a special Beckmann gallery, and placed the painting there among his other works. But Hitler and the Nazi party were growing in power and reach, and they considered Mr. Beckmann's art to be degenerate. He lost his Frankfurt teaching post in 1933, and a year later the Beckmann gallery in Berlin was dismantled. "Self-Portrait in Tuxedo" was seized by the Nazis and sold abroad in 1937. Mr. Beckmann was not Jewish, but he left Germany that year, just as the infamous "Degenerate Art" exhibition—which included 10 of his pictures—was opening in Munich. He moved first to Amsterdam, where he remained for a decade, until he was able to secure a teaching post at Washington University in St. Louis (and later the Brooklyn Museum Art School). His masterly self-portrait had an easier route to the U.S. Charles L. Kuhn, then the curator and later the director of the Busch-Reisinger, purchased the painting in 1941. It was the first modern painting to enter the museum's collection, and it remains one of its best.